Raise your hand if you need to move it more. . . . picture me sitting over here wildly flailing my arms around. I fully admit that I slacked off and got way too lazy. Of course, I had no control over some of it. I may have wanted to workout, but I couldn’t. It had nothing to do with lack of time, place or anything like this. I literally could not breathe to do my beloved Leslie Sansone workouts. Thanks to H1N1 in early October, it took me until January to feel like I could workout. Just walking across the room left me winded and needing my inhaler. For the New Year, I finally felt like I had the stamina to get my rear in gear and do some walking and kicking with Leslie Sansone. Over the last few weeks, I have dusted off my Omron Pedometer and DVDs to get moving. Monday morning I was ready for my third workout in a row, but something stopped me and woke me out of my sound sleep. I had a huge split in my heel and could not walk (also quite pink looking). I took a day off to treat it with antibiotics. The following day, I worked out and felt good with two miles. Yesterday, we were running around at stores getting lots of walking in. I also bought new batteries for my pedometer since mine died Friday night. I had read about these last summer when they came out. They are Leslie Sansone DVDs that come with workout boosters. Unfortunately, the Targets in our area did not carry them. I figured one day they would show up here. Today was apparently that day. There I was at Target unsure of which one to try. 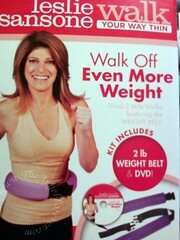 I knew I was not interested in the one with the Walk Belt since I already have a DVD for that, along with a Belt. The Toning Bands was not high on my list since we have EA Sports Active for Wii. The other three were quite interesting to me. In the end, I went with the following since it was very different than anything else I have. So tonight, I am hoping to test this out and see how it goes. Hoping that these will help me to get ready to walk up a storm at Disney World for the Social Media Moms Celebration. I know that doing these last year were huge in getting me ready for our May trip. No, I may not drop a lot of weight before the trip, but at least I can get myself some great exercise. I can’t wait to read what you think of this dvd! I am getting reacquainted with Leslie’s walking and kicking myself! .-= jen (@bwJen)´s last blog ..Week in Review =-. Also, I’m debating between the EA Sports Active for Wii and Your Shape… not sure which one I’d like better. .-= Nichole from The Guilty Parent´s last blog ..Crushing science fair dreams: One student at a time =-.